Tema en 'Ebooks & Tutoriales' comenzado por foxbat, 24 de Julio de 2013. In Part 1 we?ll start introducing our 1st problem, how to create a realistic water plane renderable with Mental Ray and Final Render, add a big object that will be a rigid body falling inside the water to create an amazing splash effect. We?ll see how to create the mesh with FR Ocean, (but we?ll take a fast look at Houdini Ocean Toolkit for 3ds max too), then we?ll prepare realistic water shader in Mental Ray using the Arch&Design material and in Final Render using the FR Ocean Material. We?ll see how to create a believable environment using the MR Sun&Sky and working with the Exposure Control, or how to create it in Final Render playing with the Indirect Illumination Skylight tabs/options and how to achieve the right look working on the FR Camera parameters. In next chapter we?ll star. 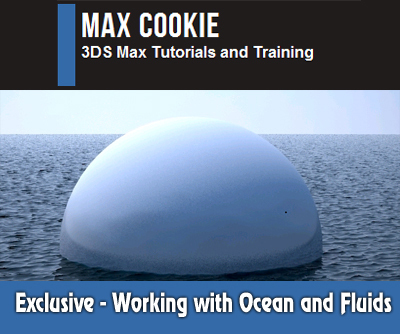 In this Citizen video for 3ds max, we?ll continue working at the Fluids and Ocean series.This time we have to introduce some Realwave related features. We?ll see how to start creating a believable water plane adding two wave layers over it. Then we?ll take a look at how to play with scaling, resolution, choppiness and how to export it in 3ds max, apply our sea shader and render it with Final Render. Then we?ll start checking the other features useful to solve our main problem, so we?ll take a look at object dynamic interaction, splash particles generation, (with various related daemons), and basic foam mask creation. At the end of this video we?ll have all the basic informations we need to create the complete scene proposed in RealFlow and exporting it in 3ds max for rendering. In this Citizen video for 3ds max, this time we?ll start to talk about spray effects due to object collision with the water plane. To start working on it, we?ll prepare a really simple setup with Particle Flow using some particles linked to the falling body that will collide with the FR Ocean. When the collision event will happen, we?ll spawn the particles and using Drag, Wind and Gravity forces we?ll try to simulate the water spray. Our setup will work fine in viewport but at the end of the video we?ll try to render it to understand how it will works in rendering using Krakatoa trying to figure how we have to tweak and improve it. In this Citizen video for 3ds max, we?ll move forwad talking about Realwave again. We?ll take a deeper look at the crest particles emitter, to see how to use it to create crest foam and spray, how to work with it and with forces as gravity and wind. We?ll add more daemons to control particle life and visibility, and we?ll have a look at every single parameter to understand how to use it. At the end of the video we?ll start introducing next step in Realflow, preparing a simple minimal scene with Hybrido tools. In this Citizen video for 3ds max, we?ll continue talking about fluid simulation in Realflow. We?ll start to take a deeper look at Hybrido engine, so we?ll see how to use the domain grid and how to work with its parameters, then we?ll see in depth the emitter topic and see how to optimize grid for simulation. At the end we?ll start to introduce secondary emission feature in Hybrido that give us the possibility to simulate spray and foam as a normal Realflow particle emitter, we?ll see how to add it to the domain, and how to start working with its parameters. This video will be really useful to introduce topics related to our final scene so we?ll prepare a simple Realwave simulation with just one wave generator and we?ll see how to export it using the Export Central tool, then we?ll merge it in 3ds max using the Next Limit plug-ins and we?ll assign a FR-Ocean shader to render it using FinalRender. Next step will be to create a simple falling mesh in Realflow, simulate its collision with water plane and export it in SD file format back in 3ds max to be rendered. In 3ds max we?ll take a look at some simple smooth issue we can encounter. Back in Realflow we?ll add a particle splash, and we?ll see how to export it in binary format and in PRT Krakatoa format too, then back in 3ds max we?ll use PRT Loader and Krakatoa to render it. We?ll check if it works fine in Combustion tuning rendering/density parameters. In this video part of Working with Ocean and Fluids citizen series, we?ll start working at a complete scene with 3ds max. In the past we talked about all the features we need to do it, trying to figure how to use it and introducing techniques, tips and problems we can encounter. We?ll prepare the basic environment created using real scale unit to have a more precise lighting, we?ll use Final Render Ocean mesh to add the ocean mesh and simulate the water animation, so we?ll work a little bit with its parameters to find the best compromise between level of detail and amount of vertices used. Then we?ll tune the wave parameters and the ocean speed to make it more realistic and with the real scale. Talking about the rendering we?ll use Mental Ray to reach a major user base, so we?ll create a basic water material using an Arch&Design shader, and we?ll use the MR Sun&Sky to illuminate the scene. To obtain the best result we?ll play with Sky parameters and with MR Exposure Control too, tuning colors, illumination value and general image look. In this video part of Working with Ocean and Fluids citizen series, we?ll start working using Particle Flow to setup the spray effect and Krakatoa to start planning how to approach to rendering. Using PFlow we?ll try to solve different problems as particle spray emitted at 1st collision between the falling object and the water plane, and it will be a simple problem to solve. Then we?ll have to control the air interaction between water and general dynamic. Then back to water interaction when the spray will falls down. To solve all these collision we?ll use the Krakatoa Collision event due to its speed. Last part will be useful to understand how we can use the spray to simulate water foam. We?ll start to play a little bit with Krakatoa render to understand how many problems we can have trying to render a so huge number of particles. In this Citizen video for 3ds max, we?ll start working on a big and exciting course. We?ll talk about water, fluids, ocean, and fluid dynamic. We?ll take a look at how to solve fluid dynamic problems using 3ds max, some plug-ins as Frost to create fluid meshes, Krakatoa to render foam and spray, PFlow and Thinking Particles to simulate spray and foam, Realflow and Naiad to create complex fluid dynamic simulation or simulate the water level, etc etc.